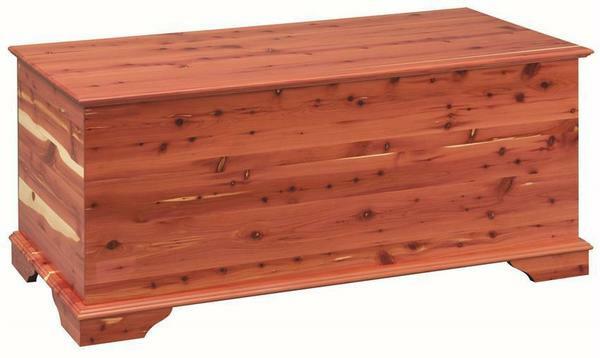 Our Amish Furniture Basic Hope Chest is the perfect choice for economical cedar storage. The Basic Cedar Hope Chest comes without a lock but you have the option to add a lock if you would like. The lid is constructed with a standard folding style. This Hope Chest is proudly made in the USA from 100% real cedar wood by Amish craftsmen! You can use this chest in any room to add additional storage. Plus, receive Free Shipping! This chest offers 6.7 cu. ft. of storage and measures 42” W x 18½” D x 19½”H. For any personalized engravings, please note your request at checkout, or place your order and we will call to confirm your personalizations. (Up to three lines of text - choice of font) If you select to have a Brass Plaque, expect a call within 24 hours to receive your engraving message. This plaque will be mounted on the inside of the lid unless otherwise specified. Call one of our Furniture Specialists Today at 866-272-6773 if you have any questions, or would like help processing your order! Our fully staffed team of professionals will be happy to assist you! Thank you for shopping with DutchCrafters.